Warning: This is probably the most speculative page on this website, and will, no doubt, be judged ‘ludicrous’ by ‘serious scientists’, but since they have no explanation for the things I am after and even can’t be bothered by these mysteries anyway, I can’t be bothered by their judgement and I hope you neither. The theory of resilient rock is an attempt to make sense of the idea that earth magnetism (energy) can be beneficial (maybe also harmful ) to living species and why some places have more of it then others. The bare rock surfaces we find in Orkney are battered by the waves of the Ocean for hundreds of thousands of years and they crumble eventually, as we see it dramatically shown at the Kame of Hoy and St John’s Head, the latter being the highest vertical cliff face in Britain, just short of 1000 feet high (290m), rising from sea level. These bare rock masses cannot but impress the spectator for their dramatic contrast to the further gently undulating hills of Hoy and Orkney in general, they represent an epitome of powerful resilience, that seems to radiate a mysterious energy, like bare living-rock faces of mountains do. The theory holds that cracks in the crust of the earth create a Casimir-effect between the two sides of the crack that can be much less than a hair line of width. To make a rock face crumble at first small cracks must appear however tiny they are, indeed in nanometres; together though they may create an intense, yet subtle field. Something similar but on a more obvious scale holds for fault lines in the earth crust where one will often find lakes, rivers and waterfalls, all instances of bare rock exposed to the air or to (streaming) water, all places that influence the human mood positively, because we experience the subtle but vital energy. On Orkney we find a profusion of sea stacks, natural arches, caves and geos, which are all the result of a way of cracking the crust of the earth under the natural elements of erosion. A ‘geo’ (pron. g’yo) is on Orkney a crevice in the coastal rock, where the sea enters deep into the rock face, usually a local fault line. The idea is that these bare rock faces, because of the Casimir-effect, not only radiate subtle energy but also form alignments of concentrations of this energy as you will find them in hill tops. Charges will flow to the (sharp) points in a surface, also in the human body these are the most sensitive, so hilltops and mountain tops, especially when exposed as bare rock, produce, what I would call, living-rock-radiation-fields. These fields may enhance the powerful sensation of standing on the top of a mountain, because of its positive energy. We are talking here of very subtle energies much like the earth magnetism of which they may be a subtler variety. It may be that these fields can only be sensed by something living, not by instruments. It is these natural magnetic and possibly quantum energy alignments, their crossings and their endings that I presume were chosen as places where to build chambers and cut circles out of the living rock. All things to do with springs, mineral waters, mud, hot springs, relate to human health and are known to be beneficial. Stone Age people were no doubt the first to realize that. It maybe the subtle radiation of the abundant minerals in the rock and its waters resonate with the minerals in the body. I think it is highly significant that exactly at the near perpendicular crossing of two major natural alignments on Mainland Orkney, of which one extends some 50 miles from Hoy, over the island of Rousay to Westray, and the other between Stenness and Brodgar to Hole o Row near Skara Brae, that at that crossing we find the Ring of Bookan, possibly the first circle hewn in the living rock in Britain or anywhere. 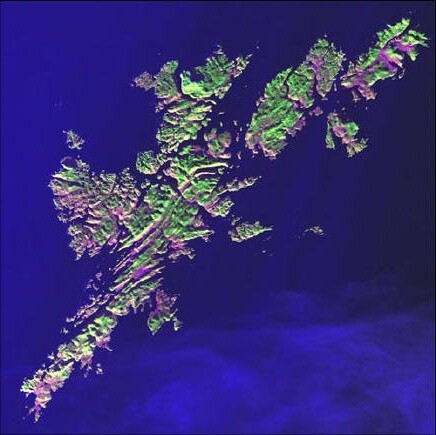 It is interesting to see how parallel these fault-lines can be when they come to the surface as we see it on Shetland on this clear picture from space below. The pliability of living rock. It is rather safe to assume Bookan was chosen for the energy of the surface fields. The moat was cut around the spot, irrespective of its outer wall. It seems a bit inappropriate to call these huge earth works ditches; these are moats, meters deep and wide, which most probably also were quarries for the works in their vicinity. Draining and collecting drinking water, maybe even irrigating the fields below, may have been its initial function, thus creating a beneficial area for staying longer periods on the (drained) spot. Once cut their unexpected enhanced energy may have been discovered. When we combine our theory of surface tension of the earth crust with the idea that energy flows to hilltops and artificial outcrops of resilient living rock, which sustains life, we can be more aware and open to the signs of nature itself. 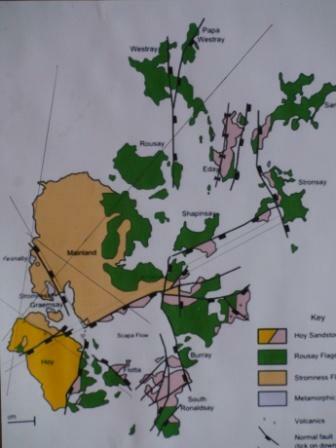 Berriedale, the only indigenous woodland in Orkney lies sheltered behind the gigantic rock faces of the Kame of Hoy and St John’s Head, on the supposedly major natural energy alignment along the west coast of Hoy and Mainland Orkney. It is in the tiny narrow gorge of Berriedale, near Rackwick bay, where birch and willow grow since the end of the Ice Age and it is further north at Yesnaby where the very rare Scottish Primrose flowers, all on this same supposedly beneficial energy alignment of resilient rock. We can now appreciate that the circles cut out of the living rock may have been devices to manipulate this natural surface energy and, maybe, store and bundle it inside the rock cut ring. Probably the Ring of Bookan, a henge, is earlier than the moat of Maes Howe, but it is noteworthy that it has the same kind of uninterrupted circularity, without causeways, which is rare. In both cases there was a rectangular type of chamber in a circular mount in the middle. Some people, particularly Japanese, experience strong spiritual energy in the middle of Maeshowe’s hall. Maybe Bookan even preceded the henges of Stenness and Brodgar, its area anyway attracted a profusion of tumuli in later days, which we do not find near Stenness or Maes Howe. The circle, dug and cut to source the surface energy, may have been a first experiment of its kind ever and it began on one of the most conspicuous energy points of Orkney, in Bookan, the centre of the two perpendicular alignments, among the most significant of Orkney. Rather crucial to this view is that the Ring of Bookan was cut out of the living rock, which seems to be only so for the major part, but the rest may be damaged by plowing or was an outlet for irrigation. It shows anyway that the centre point was more important to be circled, than whether the moat held the water, possibly, but excavation will show more about this question. The next step in this process may have been the moat of Stenness with the maybe later added stone circle, but this moat has a causeway that most probably was meant to point northwards from the centre (there is evidence that the north direction has been corrected, even). The point here is that they might have found out that when you manipulate this earth force it clears the skies in its vicinity, which could be enhanced by creating strong reverberations by drumming between the resonating stones, Stenness has an echo! You create an area of higher pressure and that by doing so you drive away or evaporate the clouds overhead and receive more sunshine than without the circle. It is said on Orkney that nowhere the sun shines as on the Stones of Stenness, which may be an indication that this effect still lingers, although there are other explanations for the clear skies above the two loughs. There is no doubt that certain places on Orkney have persistently more sunshine than others (Birsay), as there are nowhere as many rainbows (and as little wind) probably as over Finstown Bay (of Firth), which may be one of the the reasons for the three or more Maes Howe-type chambers there. 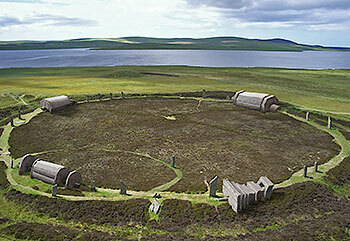 Two stones of the circle of Brodgar are known to have succumbed to a stroke of lightning. Lightning may have become one of the great ravagers of stone circles over time. When just cut out of the living rock the stones would easily withstand a stroke of lightning ( a stone struck by lightning may have been symbolised by axes and daggers as marked on some sarsen uprights of Stonehenge, symbols of the Baltic thunder god Perkons) but aged as they are now, water logged, cracked, they may easily fall prey to lightning and rent asunder, as it happens. So not only could the circle and most certainly three circles in a row with a fourth nearby, produce more sunshine, they also may attract or even generate a thunderstorm, which is known to come with rain, and very welcome in a very dry summer, for agriculture and people alike, the moats would collect the water, especially when the surface was clad with clay, as is often found. The energy effect of the henges may have been dramatically diminished by the silting of the moats, the age of the stones and most of all, the absence of a full circle of big stones. The settlements at the Ness and Barnhouse could use fresh drinking water since no well or spring is nearby, only at South Ruskie, the water Hill, with its ever changing moving springs, a mile away. Note the straight road to Ruskie Hill from Stenness, this is exactly parallel to the line which connects the centres of Bookan and Stenness, it also crosses through Brodgar, it is part of the major alignment on West-Mainland. In short, let us suppose that because of the rings they were capable of improving the weather locally by 20% or more sunshine and ditto rain; that’s worthwhile. So not only were the circles beneficial, as probably in the case of Bookan and Maes Howe, but the circles could also be dangerous when you were out in the open with lightning and not protected as inside the chambers. In this approach the people who cut out the stone circle moats and placed their communal refuge and storage places (grain!) on spots with beneficial earth energy, the megalithic builders, are seen as cosmologists, and scientists ‘avant la lettre’. The motivation to undertaking such huge works in order to control and manipulate the energy of nature, is not different from that which inspired the rock-cut circle of the Large Hadron Collider in Geneva, that has started operating again, after its prompt initial break-down. Natural energies forced into a circle can generate and unleash unexpected and tremendous forces. Found this funny picture of LHC Brodgar on Google, from the Particle Physics Experiment Group, these guys got the spirit.